On April 28, Martin Lipton, Chairman of NYU, and its President, John Sexton, announced that hedge fund billionaire John Paulson would receive the “Albert Gallatin Medal for Outstanding Contributions to Society” at NYU’s 183rd Commencement ceremony, slated for next Wednesday. Albert Gallatin was one of the founders of NYU and a former Treasury Secretary under Thomas Jefferson and James Madison. Gallatin is buried in Trinity churchyard at the corner of Wall Street and Broadway – and he’s likely rolling over in his grave at the idea of having his name appended to John Paulson. John Paulson is the founder and head of Paulson & Co., infamously known on Wall Street as the firm that conspired with Goldman Sachs to create Abacus 2007-AC1 – an investment Paulson & Co. assisted in designing to collapse in value. On April 16, 2010, the SEC brought charges against Goldman Sachs and one of its young vice presidents, Fabrice Tourre, for “defrauding investors” in the sale and marketing of Abacus. Paulson & Co. slipped through the net because it didn’t sell or market the product – it simply shorted it based on its inside information that it was designed to fail. In July 2010, Goldman Sachs settled with the SEC for a payment of $550 million. Fabrice Tourre was subjected to a jury trial and ordered to pay more than $825,000 in gains and penalties. 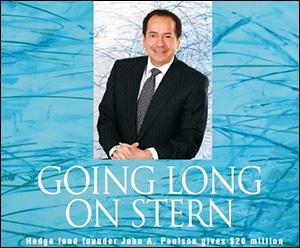 John Paulson and his hedge fund skated and kept their profits. The article goes on to note that “the School has named the first floor lobby of Tisch Hall and the School’s auditorium” in Paulson’s honor. Two current Trustees on the NYU Board were previously involved with Lipton in the New York Stock Exchange compensation scandal: Laurence Fink, CEO of BlackRock, and Kenneth Langone. Fink and Langone served on the NYSE’s Compensation Committee while Lipton was simultaneously advising Richard Grasso, CEO of the Exchange, on his compensation package while also serving as counsel to the Exchange’s committee on governance and as Chairman of its Legal Advisory Committee. The Compensation Committee awarded Grasso $130 million in compensation and benefits for the three-year period of 2000 through 2002, a sum that represented 99 percent of the Exchange’s net income according to then New York State Attorney General Eliot Spitzer. Spitzer sued Grasso and Langone in 2004, charging Grasso with unreasonable compensation from a not-for-profit corporation and Langone for breach of his fiduciary duty for not informing the full board on the details of Grasso’s compensation. The case was eventually dismissed by the New York State Appellate Division on July 1, 2008 on the basis that the New York Stock Exchange had now become a for-profit entity. A group of approximately 400 faculty members at NYU think that NYU’s Chair and President, Lipton and Sexton, have lost touch with the moral, educational, and student needs of the university and are running NYU as a tyrannical slush fund for privileged interests. The group is known as the FASP, Faculty Against the Sexton Plan. In 2013, five schools at NYU gave Sexton a no-confidence vote: the School of Arts and Science, NYU’s largest school; the Gallatin School of Individualized Study; the Steinhardt School of Culture, Education, and Human Development; Tisch Asia and the Tisch School of the Arts faculty in New York. Those votes were followed by a front page expose in the New York Times revealing that NYU was giving Sexton and others obscene perks, including below market rate and/or forgivable loans for vacation homes. Rectenwald went on to explain that contract faculty, not tenured or tenure track faculty, make up 70 percent of the teaching faculty at NYU. According to Rectenwald, “the average starting salary for a full-time contract faculty member is an estimated $60,000 to $65,000 per year. The average per-course compensation for part-time contract faculty is roughly $5,000. A member of the latter group, if ‘lucky’ enough to be offered them, might teach eight courses a year and accrue around $40,000 a year.” Without discounted housing, that amounts to considerably less than a living wage in New York City, says Rectenwald.